Last week while reviewing the x-rays of my spine at a chiropractic clinic the chiropractor pointed at my scoliotic spine and said, “Yah, this is pretty nasty”. I was shocked. Had I misheard him? He flipped to the next image, this one of my lower back, “This one too, nasty stuff.” I left the consultation feeling malignant and grotesque. His wife, Dr. Angela with whom he shared the practice called me an hour later wanting to “check in” and making sure I was doing okay after the appointment. I told her that no I wasn’t okay, that I was struggling to make sense of the way in which “Dr. Doug” had framed my condition using words like “nasty”. She replied saying, “Well sweetie, he wasn’t saying you are nasty, he was just talking about your back”. This comment left me feeling puzzled. According to the Dr. duo, was my back not me? Did they feel like they could point at x-rays and make crude remarks as if the patient sitting beside them was in no way connected to misaligned or should I say “subluxated” vertebral column before them? I find the possible implication of their comments troubling to say the least. In failing to recognize the connection between mind and body, these doctors revealed to me the degree to which we have disassociated ourselves from our own bodies. Is not Decartes’ “I think for I am”, a central tenet of Western culture, insistent upon our disembodiment as a distinguishing feature of civilized peoples? The consequences of our disembodiment are no more evident than in the current environmental crisis. Only by denying our connection to our bodies, the air, water, and earth we consume, have we been complicit in the continued exploitation of the Earth. Furthermore, disembodiment has been engineered within the patriarchal structures to denigrate and dominate “the other”, by separating them from each other and themselves. According to the western tradition, women, at the mercy of nature as life bearers, are subordinate to men, who, not bound by their bodies may transcend the corporeal and inhabit the cultural, the intellectual. As a western women, I carry Eve’s disgrace, internalizing the guilt and fear of not being born a man. We are told our bodies are sinful and dirty and for that we seek distance from our bodies. Residing in the cerebral and virtual realms, western culture enables our dissociation from our own bodies in effect allowing us to avoid the persistent reminder our bodies provide of our mortality. What’s more, living in and privileging the mind has allowed us to be the primary beneficiaries of exploitation of peoples and nature while evading any sense of responsibility for that which occurs in the physical realm. Now, faced with global warming and the deepening of generational poverty worldwide, we have retreated further into the cerebral, turning to sophisticated technologies to mitigate environmental impacts and to aid-based development initiatives to modernize “underdeveloped” societies that devastate traditional and local cultural identities and communities. Maintaining “objectivity” in this work that purports to heal, ensures a level of disembodiment that keeps us from connecting with others. But objectivity, like disembodiment, is a fantasy thought its effects are frightening and real. The Lakota tradition provides a new understanding of the self and of embodiment that defines the relationship between human and natural world, intended to establish wholeness in the midst of fragmentation. Envisioning the self extending beyond the confines of the skin, Lakota see the world as self and self as world. Drawing on my experience of the Lakota culture, I have discovered re-embodiment to be the work that connects and heals, restoring our value. The body like the land has intrinsic value and should be cared for. This concept is grounded in the Natural Laws, one of which, the seventh Direction, is centered around taking care of the four parts of the self: mind, body, emotions and soul. The Seventh Direction recognizes “our divine, as we look within to understand we are holy and deep within” (The Four Directions). Taking care of these four aspects of our beings as best we can will allow us to according to David Little Elk, “establish inner peace within ourselves”. He continues writing “Nature projects the state of being in our inner world to the world around us. Thus, if we do not maintain our Seventh Directions, then we contribute to the continuing violation of our Mother Earth.” (Elk). By taking care and being aware of our own bodies can we heal the body of Mother Earth. The Sixth Direction, Mother Earth “reminds us we are all a part of a greater whole and we have all we need. This direction nourishes us and reminds us that “we are all connected and never alone” (The Four Directions). 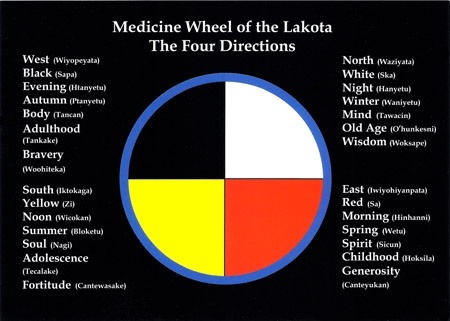 The Seven Directions expresses this concept of wholeness, harmony and balance that is maintained through Lakota spiritual practices. For me and many Lakotas, this healing takes place in the case of the Sweat Lodge in the womb of Mother Earth. On Pine Ridge Reservation, I began my experience feeling uncentered and disconnected from my heart center from my body and through ceremony regained a sense of balance. In sweat and Yuipi, I encountered for the first time I my own female power as I grappled with the fear of inadequacy of being female within a patriarchy. Not only did I encounter vulnerability but also strength and courage. I discovered a power that insists “I myself am the other”, that insists wholeness-in-self, this power that is dangerous to the integrity of patriarchal structures by seeking the courage through prayer in ceremony to rediscover and re-inhabit my body. The moon, in the Lakota tradition, symbolizes the female power. The Lakota people see a woman’s face in the moon not a man’s. From the moon came women. The moon is explicitly connected to women’s menses, pregnancy and fertility. Menstruation is not a weakness in Lakota thought but a source of power. During a woman’s “moon” or period, her power is overwhelming and the spirits are with her. For this, she cannot enter ceremony because her power will override that of the medicine man. Women are central actors in the creation myths of the Lakota people. White Buffalo Woman endowed the Lakota people with the sacred pipe. If we assume women to be more “in touch” with their bodies through their reproductive cycle (though it is currently thought of as a shameful burden), could Ilarion Merculieff, an Aleut elder, be correct in saying women will be the ones to initiate these changes? Healing for me is not about “beating disease” or “fighting poverty” but about grappling with the ephemeral nature of our existence by connecting to our heart’s centers and recognizing the beauty within and amongst. By connecting with the Earth and the ancestors we may embrace the vulnerability of our bodies that will allow us to feel, not deny, the vulnerability and suffering of marginalized peoples and the Earth. Transcendence and healing come not through our disembodiment, as the western tradition insists, but through our groundedness and connection, as the Lakota culture exemplifies. what a beautiful and thoughtful article. I do believe the patriarchy is in its final stages of power, but after my daily encounters with those poor people who have been brainwashed by patriarchal religions and education –millions of them all around– I lose all hope this will happen even in my children’s lifetime. I was surprised to see the postcard of the Medicine Wheel of the Lakota that is displayed on this page! When Mandy Foster and I were cultural interpreters at Tatanka: Story of the Bison near Deadwood, South Dakota, we designed the educational poster upon which that exclusive postcard was based. Have you had the opportunity to visit Tatanka? There is a lot of interesting information there for educators and the public alike. I’m glad that you thought the postcard was worthy of sharing here.